Verified Owner Comments: I expected this to be an excellent, straightforward watch and that's exactly what I got. I'm glad I went with the numeral version, for me it's more interesting visually and I love the balance of the dial with the date so easily ignored (until you want to see it). Verified Owner Comments: I am very pleased with the transaction. Very professional service staff on the phone. Watch arrived the next day. Great communication by email throughout including the tracking. Very happy with the watch itself. Packed thoroughly and in perfect condition. Recommended. Verified Owner Comments: This is probably the most most iconic watch you can by new for under $2,000. It's from a well respected brand in Sinn and the model itself is a distilled version of the brand's famous design aesthetic and really gives you one of THE quintessential modern German sports watches for an extremely affordable price tag. "My 556 A - 5 year report"
Verified Owner Comments: Love it. I've been wearing my 556 A daily for 5 years now. It still keeps great time and is due for a service but has never had one so far. I wear it for all occasions, including outdoor work and other activities. It's suffered some dings over the years, but that just proves it's a very capable and durable timepiece. It really is a solid choice if you don't care for the bead blasted case or the other advanced features - or if you just want to go the economical route as opposed to getting the also very capable and slightly more expensive 856. 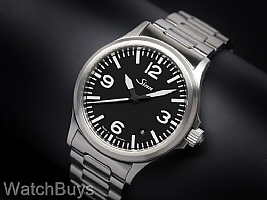 Verified Owner Comments: This watch is great quality and the legibility is top notch. Being someone is is near sighted and uses glasses, I can read the time on this watch without my glasses, compared to my other watches that I either need them for or need to bring the watch closer. The watch design is very simple yet elegant. The movement is something to admire, I find myself starting at it constantly. Verified Owner Comments: I've been wearing my new 556A for 4 weeks straight now and can't speak highly enough about it. The case finishing and overall feel is fantastic. I think that the legibility of the A version makes it an easy choice over the I, but makes it less dressy (though I think that this makes it look better on the bracelet). It has been very accurate at about +6 to +7 seconds per day, but this improves to +3 or +4 if I store it with the crown side up. "Lives up to everything you've read on the forums"
Verified Owner Comments: This is an extremely versatile watch which it can be used everyday watch to dressy. Have several bands I'm considering purchasing so I can change it up whenever I feel the need. WatchBuys staff is first rate. From pre-purchase to post-purchase questions they have provided on of the best service I've encountered. Thanks! Verified Owner Comments: I wanted a quality daily wear watch that was attractive yet low key. This Sinn fits the bill quite nicely. The movement is extremely accurate; I check it against my computer at work and it has rarely been off more than a second. The numerals and the anti reflective coating make it very readable. This is at the bottom of the Sinn line, but the downsides are minimal. The size is small by today's standards, but is classic and still wears well. The case is not tegimented so it will incur some scratches over time. If you can afford the extra expense of the 856 (including servicing) it would be a better choice, but the 556 A remains an excellent watch for the money. Verified Owner Comments: Can think of a more utilitarian watch. It tells the time at a glance and does that VERY well. Incredibly accurate with the top grade movement. Looks great for all occasions and can also take just about any strap you put on it. Can be dressed down or up easily.